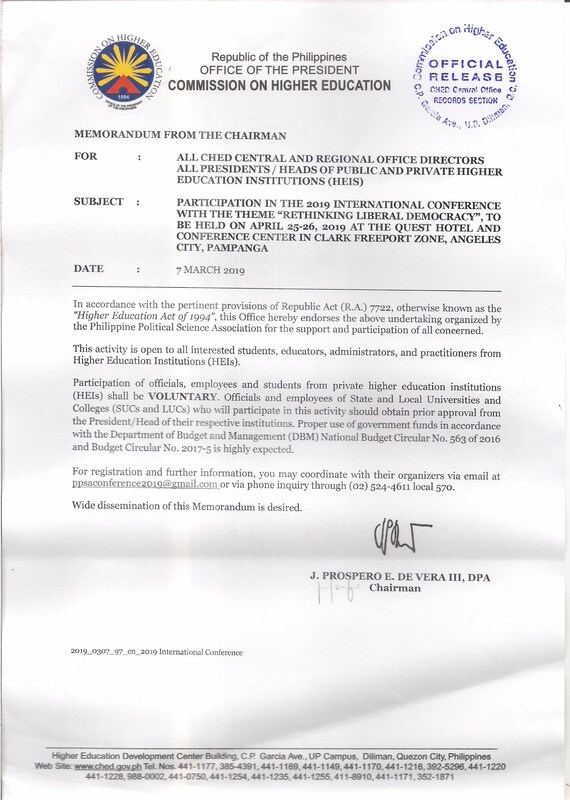 The Commission on Higher Education has officially endorsed the upcoming PPSA International Conference on April 25-26, 2019 at the Quest Plus Hotel in Clark Field, Pampanga. Interested parties may now download the CHED Endorsement below. We are happy to announce the release of the 2019 PPSA International Conference Official Program. Interested parties may now download the official program below. Paper presenters are advised to check the schedule of their presentations during the two-day conference. 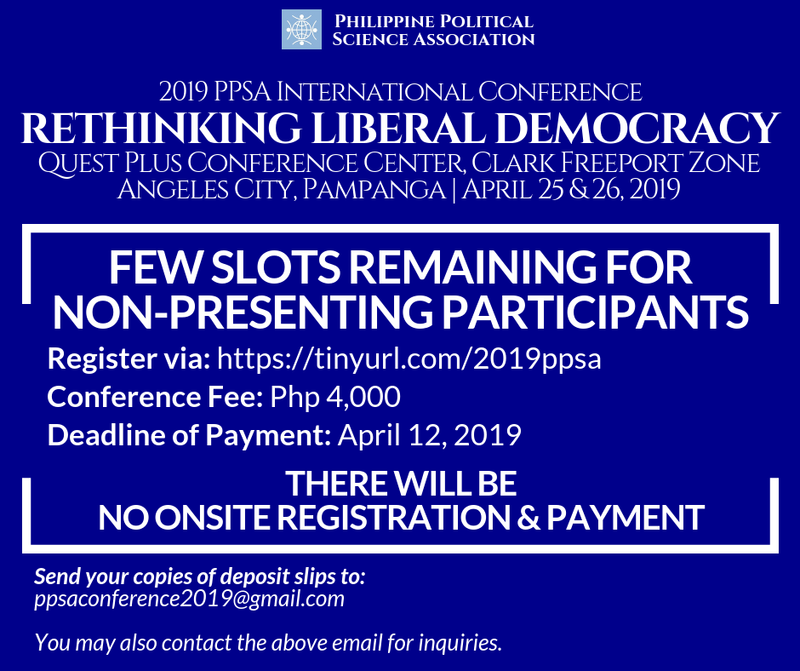 In order to better manage the upcoming Philippine Political Science Association International Conference on April 25-26, 2019, the PPSA has allocated limited slots for non-presenting participants for those who wish to join the biggest gathering of political scientists in the region. Please be reminded that there will be no on-site registration and payment for the conference. We, therefore, highly encourage interested parties to coordinate with PPSA secretariat at the soonest possible time to secure your slots for this event. Kindly see attached announcement for details. The PPSA Annual International Conference is fast approaching! 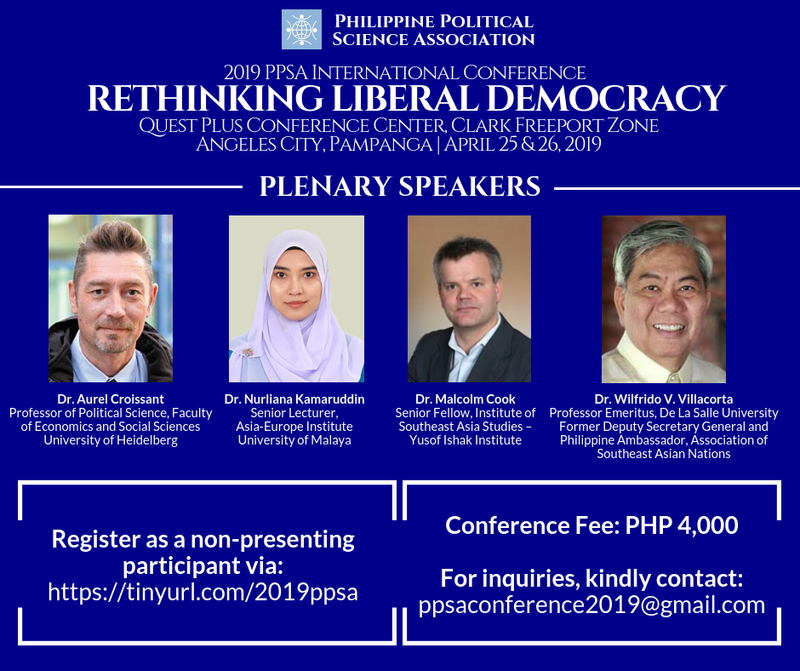 This year, political scientists from all over the region will gather on April 25 & 26 at the Quest Plus Conference Center in the Clark Freeport Zone, Pampanga, Philippines and share the latest scientific knowledge on politics around the theme "Rethinking Liberal Democracy". Please see attached files featuring our lineup of distinguished plenary speakers. 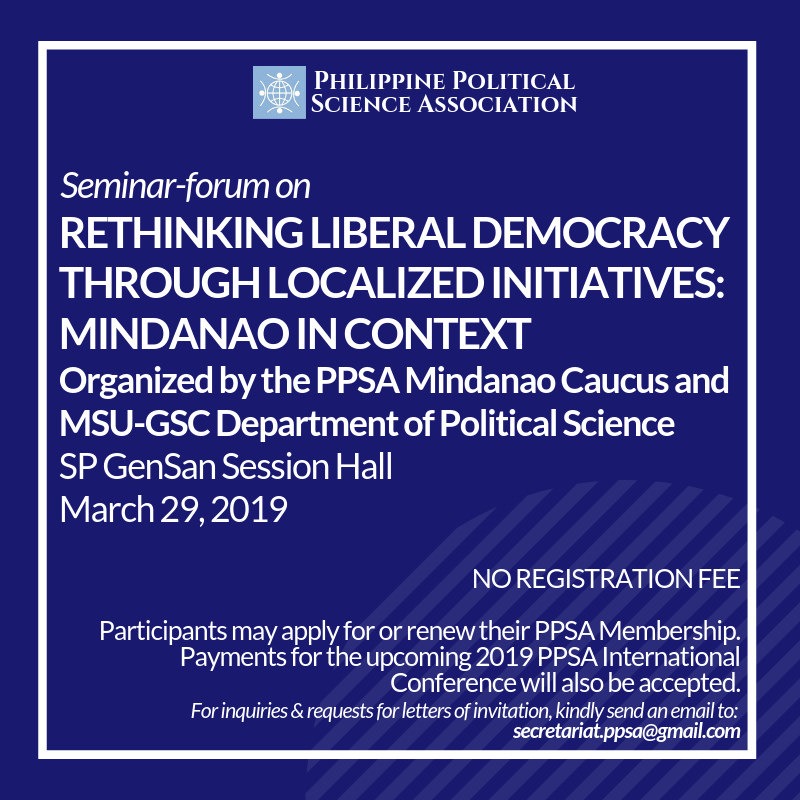 This event is organized by the PPSA Mindanao Caucus and the Mindanao State University- General Santos City Department of Political Science and will be held at the SP Gensan Session Hall on March 29, 2019. This event is open to the public. Kindly see download the attached event poster for details. 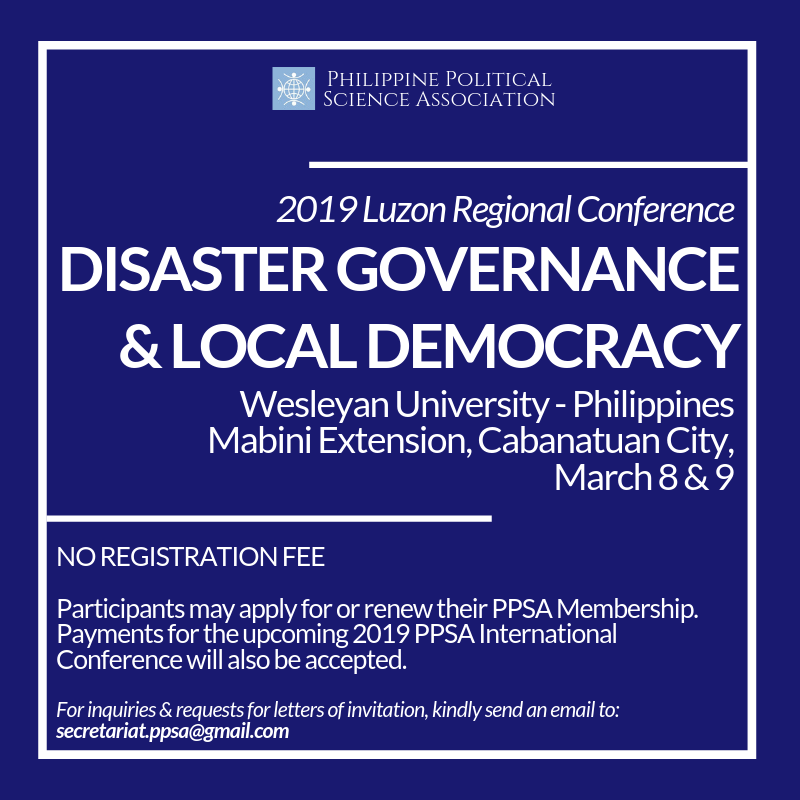 The PPSA Luzon Regional Conference will be held on March 8 & 9, 2019 at the Wesleyan Auditorium, Wesleyan University Philippines in Cabanatuan City. There is no registration fee for this conference but participants may either apply for or renew their PPSA membership on site. 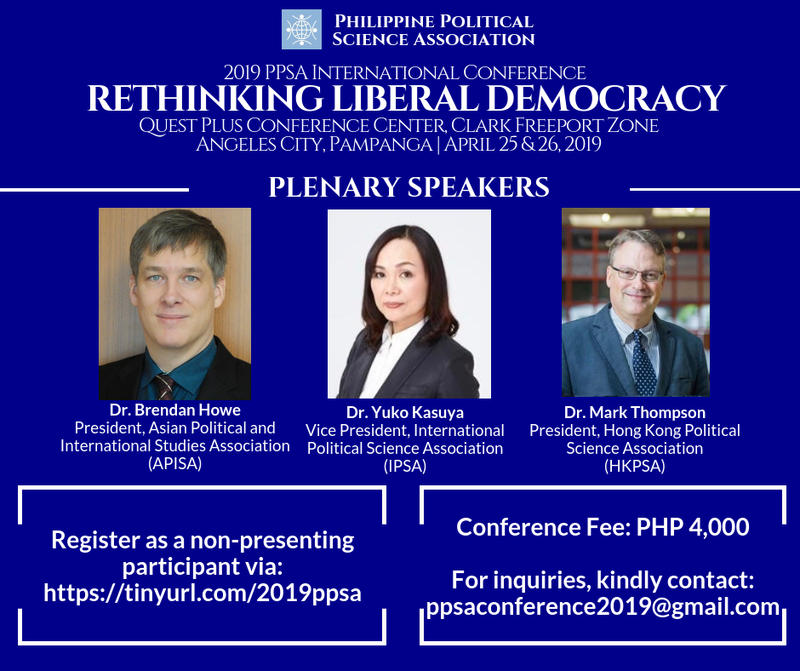 They may also register and pay for the upcoming 2019 PPSA International Conference which will be held at the Quest Hotel and Conference Center, Clark Freeport Zone, Angeles City, Pampanga, Philippines on April 25-26, 2019. All participants are required to register and pay the conference fee of PHP 4,000 on or before February 22, 2019. This is inclusive of one-year membership to the PPSA and a one-year subscription to the Philippine Political Science Journal. Only registered and fully paid participants are considered officially confirmed for the conference. Joining the PPSA and participating in the most important gathering of political scientists in the region is now made more convenient through Paypal. Kindly click in the link below to avail of our online payment facility for the PPSA International Conference. See you all in Clark, Philippines. Liberal democracy is under siege. In every part of the globe, we are witnessing what Cas Mudde termed as illiberal responses to undemocratic liberalism. Close to three decades since the end of the Cold War, the triumphalism that was prematurely heralded as the end of history has now been replaced by Trumpism in its various forms. Populist politicians rode to power on the wave of support from those who felt left behind in the globalization game and the perceived failure of liberal democracy to assert the rule of law. This in turn spurred pessimism towards the liberal world order and fanned the flames of strongman politics. In these times of uncertainty, it behooves one to contemplate and rethink the fate of the formerly dominant liberal order. Are liberal democracies self-destructing? Are key political players deliberately disrupting the old order to build a new one? How and under what conditions do liberal democracies decline? What are the factors that trigger the resurgence of autocracies? Are there alternatives to liberal democracy and populism? Is there a variety of democracy? These questions have deep implications for democracy studies and the study of democratization in the Philippines and other parts of the world. It is imperative for practitioners of political science and its allied disciplines to rethink democracy beyond liberal democracy. Dear Colleagues in the discipline! The official conference program for the 2018 PPSA International Conference to be held on April 5-6, 2018 in Davao City, Philippines is now officially released. Kindly download the program below. Presenters are also advised to check the schedule of their respective breakout sessions. See you all in Davao!